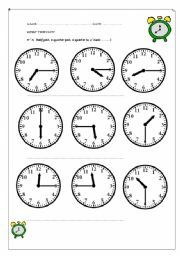 Good and basic worksheet to practice learning to tell time, by hour, by half and by quarters. 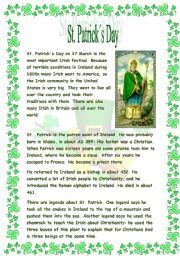 This is a three pages reading comprehension and activities based on the story of St. Patrick. I always read it with my 5th and 6th grade students. After the reading they have to answer some questions on page three. Hope it�s useful. Just a little activity for Halloween! Hope it�s useful. 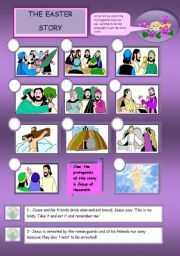 Two pages Easter story worksheet. It involves reading and sequencing the story. Hope it�s useful. 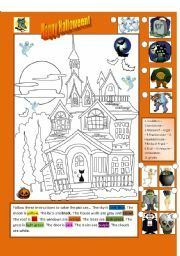 Basic Halloween worksheet: color following the instructions. 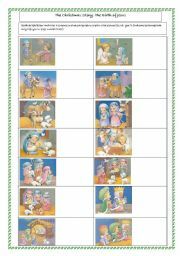 It has a little activity to review "there is" and "there are", as well as some prepositions. Brief reading comprehension to make students understand the real meaning of the first thanksgiving. 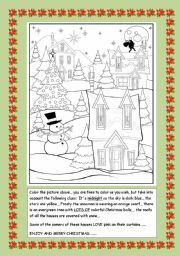 Second part to the worksheet uploaded yesterday. 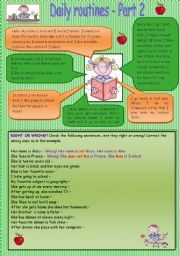 Two pages worksheet including right or wrong and correcting sentences activities. I use it to reinforce some grammar with my students (the "hated" 3rd person "s")and reviewing basic, everyday vocabulary at the same time. Hope it�s useful.